*There is a one-time new patient fee of $10 in addition to the sliding scale price. We have a 24 hour cancellation policy. There is a $15 fee for missed appointments. On Tuesdays, during the month of April, you can enjoy and acupuncture treatment for just $12! On Tuesday between 9am-1pm, our sliding scale is $12-40. Tell your family, friends, and co-workers! 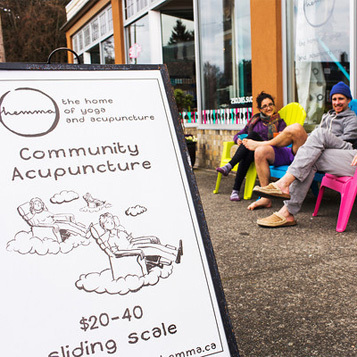 The way we at hemma are able to make acupuncture more affordable and still make a living, is to see multiple patients in an hour, so we have returned to a traditional approach. The purpose of our sliding scale is to separate the issues of money and treatment; we want you to come in often enough to really get better and stay better! Our primary goal is to make acupuncture available to you as often as you need it — the way acupuncture has always been traditionally practiced. The scale is between $20 and $40 per treatment. The scale is not based upon your specific income level, but rather, based upon what you can afford. Accessibility and Affordability have been core principles of our business model since beginning. Please free to speak with us directly if you have any questions regarding our fee structure or accessibility.